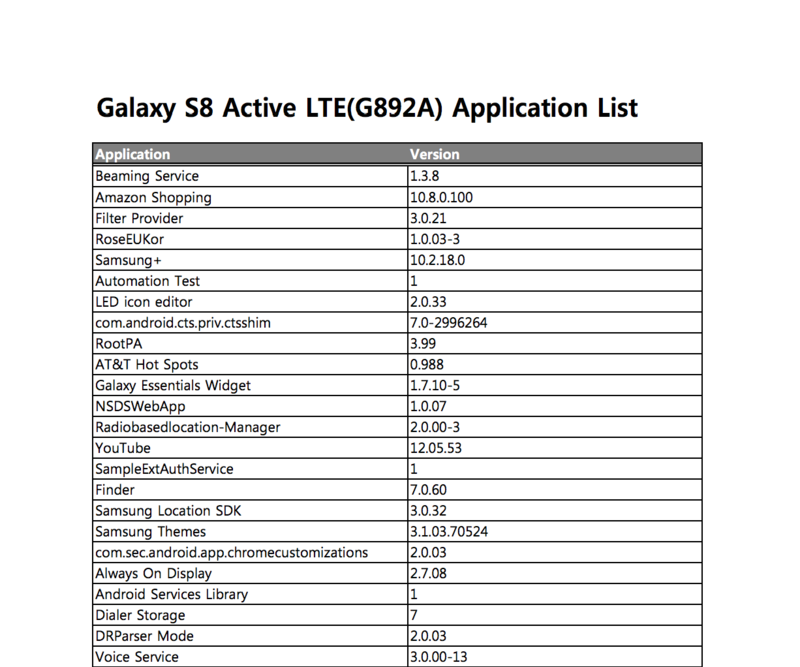 The upcoming Galaxy S8 Active (SM-G892A) has been referenced in a document, which outlines all of the applications it will ship with, on Samsung’s website, leading us to believe that the handset’s launch is right around the corner. Judging by recent leaks, the Galaxy S8 Active is simply a flat version of the Galaxy S8, equipped with a slightly thicker body that’s more resistant to knocks and bumps, and presumably compliant with the MIL-STD-810G standard of durability. Not much is known about the handset’s internals, but we’re guessing they’re identical to the regular Galaxy S8, so it should come with a 5.8-inch AMOLED display, an Exynos 8895 processor and 4GB of RAM. That said, we aren’t ruling out the possibility of the Galaxy S8 Active having a slightly larger 3,500mAh battery as Samsung has installed beefier cells in its Active-branded smartphones in the past. With regards to availability, the Galaxy S8 Active is expected to launch exclusively through AT&T in the US, and as we’ve said in the past, the carrier typically launches its latest Active smartphones in June — so keep your eyes peeled.